The Taylor Trail: Here is a photo on the bank of the Paluxy River in Glen Rose Texas. This rapidly flowing river runs through the middle of Dinosaur Valley State Park, famous for its dinosaur tracks. Not as well known is the fact that human tracks have also been found, not only in the same formation, but on the same bedding plane and in some cases overlapping the dinosaur tracks. Stan Taylor began his excavation of the Taylor Trail in 1969 and continued working through 1972. Initially, only two tracks could be seen in the Paluxy River bed. By following the trail back under the river bank, seven more very human like tracks were exposed. The process involved removing tons of limestone overburden, effectively eliminating the possibility that the tracks were carved. Below: A series of 14 sequential human footprints on the same platform with at least 64 dinosaur tracks. The drought of 1999 revealed the entire trail in dramatic detail. 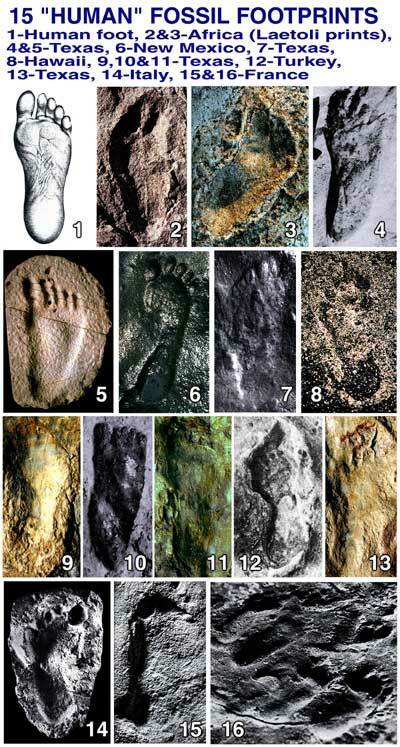 ALL OF THESE FOSSIL FOOTPRINTS HAVE BEEN IDENTIFIED AS INDISTINGUISHABLE FROM MODERN HOMO SAPIEN SAPIEN FOOTPRINTS. FOOTPRINTS #2&3 ARE FROM THE LAETOLI TRACK WAY THAT WAS DISCOVERED BY MARY LEAKEY. THEY ARE CLAIMED TO BE MADE BY AUSTRALOPITHICUS AFARENSIS, RELATIVES OF "LUCY'S FAMILY", SOME 3.1 TO 3.8 MILLION YEARS AGO USING THE POTASSIUM-ARGON DATING METHOD. 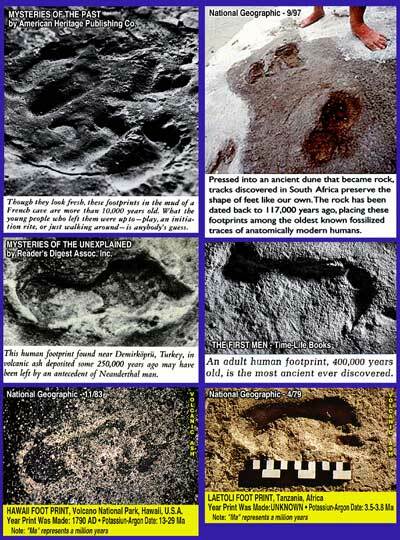 THE FOLLOWING PICTURES REPRESENT SOME OF THE FALSELY DATED, HUMAN FOSSIL FOOTPRINTS. 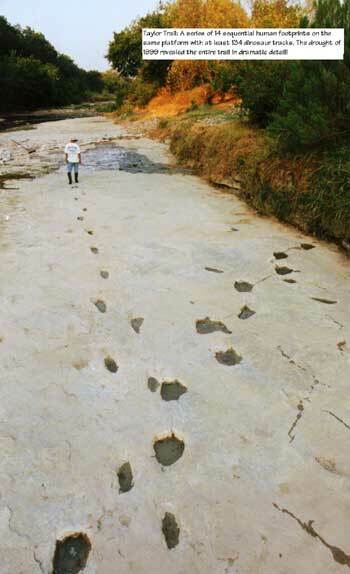 AMAZINGLY, THERE ARE NO SUPPOSED "TRANSITIONAL FOOTPRINTS" THAT HAS EVER BEEN FOUND IN THE FOSSIL RECORD TO DATE! EVEN IF THERE WERE, THE GRAPHIC BELOW ILLUSTRATES WHY THEY WOULD NOT "PROVE" EVOLUTION TO BE TRUE.